Lawndale Art Center Logo. Image available on the Internet and included in accordance with Title 17 U.S.C. Section 107. LAWNDALE ART CENTER. Lawndale Art Center was founded in Houston in 1979 under the name Lawndale Art and Performance Center. The nonprofit organization is dedicated to innovative art exhibitions, music, and performance art. The center was established principally to offer local artists and musicians a place to exhibit and perform. Lawndale became an important outlet for controversial art and performances by regional artists and a prototype for many other alternative art venues in Houston. 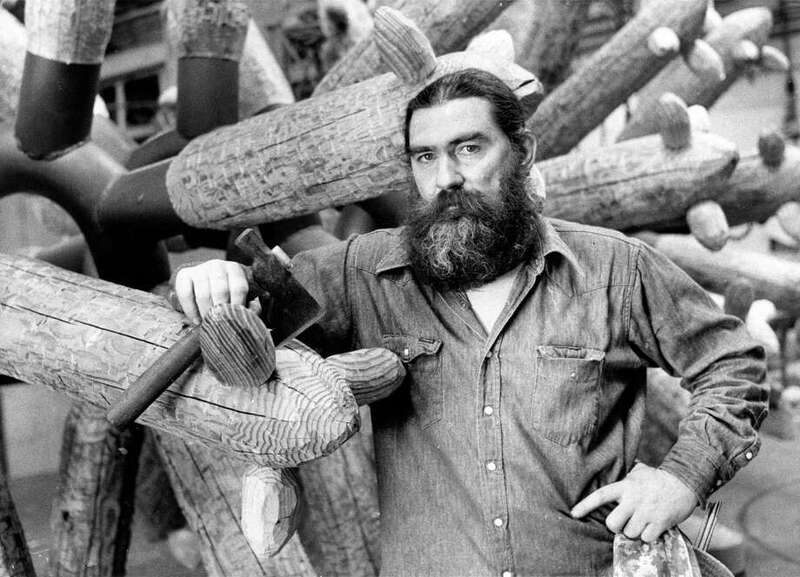 James Surls with one of his sculptures, 1980. Courtesy of the Houston Chronicle. Image available on the Internet and included in accordance with Title 17 U.S.C. Section 107. Houston Post Article about the Lawndale Art and Performance Center, 1980. Image available on the Internet and included in accordance with Title 17 U.S.C. Section 107. Image from the Lawndale Exhibit: Women-in-Sight: New Art in Texas, 1980. Courtesy of Women and Their Work. Image available on the Internet and included in accordance with Title 17 U.S.C. Section 107. After a fire destroyed the University of Houston's art annex, the painting and sculpture studios were moved to a former cable factory at 5600 Hillman in the East End of Houston, where Texas sculptor James Surls, then a professor at the university, began organizing exhibitions and performances in 1979. The first Lawndale programs were planned and implemented independently of the University of Houston, although the university bore a substantial portion of the center's operating costs. Envisioned by Surls as a "place for artistic phenomena to happen," Lawndale helped to forge a sense of community among Houston artists. Surls and other University of Houston art professors involved with the project, including Derek Boshier, Gael Stack, Richard Stout, and John Alexander, shared ideas with young artists who profited from their expertise and from the opportunity to exhibit their work. Artists such as sculptor Sharon Kopriva, printmaker Melinda Beman, painter and Rome Prize–winner Bert Long, the Art Guys (a performance–art duo), and many other artists who have since established national reputations received their first exposure at Lawndale. El Dia de los Muertos Exhibit Poster. Courtesy of the Lawndale Art Center. Image available on the Internet and included in accordance with Title 17 U.S.C. Section 107. In the twenty-first century, Lawndale Art Center mounts more than twenty exhibitions annually. Historically, such shows as Women-in-Sight: New Art in Texas (1980), Latin Spirit of the '80s (1981), and The Eyes of Texas: An Exhibition of Living Texas Folk Artists (1980) demonstrated the center's commitment to exhibiting work by women, minority, and folk artists. Lawndale also organized exhibitions centered around such provocative themes as This Land: the State of Texas (1990), an exhibition of environmentally focused artworks commemorating Earth Day, and On the Balcony of the Nation (1990), an exhibition of new works by five artists from Northern Ireland, which Lawndale organized as a counterpoint to the Houston International Festival's Salute to the United Kingdom (1990). In the fall 2002 the center sponsored, among other projects, Latino writers reading their works; art associated with El Día de los Muertos, and a program entitled Crew, about the crew of the battleship Texas. Lawndale supplements visual–arts programs with performances and lectures by such artists as composer Phillip Glass, choreographer Lucinda Childs, poet Allen Ginsberg, jazz musician Max Roach, architect Paolo Soleri, and performance artists Laurie Anderson, Spaulding Gray, and Terry Allen. Lawndale Art Center Building on Main Street. Image available on the Internet and included in accordance with Title 17 U.S.C. Section 107. The Lawndale Art Center features various murals on its exterior wall. Image available on the Internet and included in accordance with Title 17 U.S.C. Section 107. Until 1989 the center was attached to the University of Houston, which provided warehouse space, paid for utilities, and paid the salaries of the directors, who also taught courses. The center depended on private donations to fund exhibitions, catalogues, and publicity. In 1988 the Texas Higher Education Coordinating Board ordered the University of Houston to sell some property, including the Lawndale annex, in order to build a new science and research center. Lawndale became a private, nonprofit institution in June 1989 and formally severed its financial relationship with the university two months later. In the summer of 1990 the governing board voted to close Lawndale while searching for a new location. The organization subsequently moved its offices from the old warehouse site to 1202 Calumet with the intention of mounting programs in various sites around Houston. In 1993 the Lawndale Art Center moved to 4912 Main Street, in the Houston museum district—to a building built by Houston modernist architect Joseph Finger and opened to the public in 1930. The center has been praised in Art in America magazine as Houston's "most flexible, experimental venue." Christine Jelson West was executive director in 2008. Rosanne Clark, "UH's Lawndale: Taking Risks with Art," Houston, (March 1985). Jamey Gambrell, "Art Capital of the Third Coast," Art in America 75 (April 1987). Houston Post, June 13, 1989, July 11, 1990. Lawndale Art Center (http://www.lawndaleartcenter.org/), accessed February 26, 2008. Charlotte Moser, "Playing Cowboys and Artists in Houston," Art News 79 (December 1980). Handbook of Texas Online, Kendall Curlee, "LAWNDALE ART CENTER," accessed April 24, 2019, http://www.tshaonline.org/handbook/online/articles/kllnk. Uploaded on June 15, 2010. Modified on May 9, 2017. Published by the Texas State Historical Association.